On June 6, 1944, the British and the Allies didn't land on the Normandy beaches for a holiday. Omaha Beach, Utah and Arromanches were the stages, on that day, for one of the most important moments in the history of Europe and France. As a result of the Normandy landings, the Second World War came to an end. What remains of this event are the beaches, of course, the Caen Memorial and the scars to be found at the heart of the cities where the architecture was ruined by the bombings (Caen, Cherbourg, Le Havre, Falaise, and Saint-Lô). Although it is a place of memorial, the region of Normandy fortunately has a lot more to offer than the traces of this terrible conflict. The famous Mont-Saint-Michel just goes to prove this, as it is the most visited monument in France. You understand why when you find yourself facing this huge, almost entirely built rock mount which peaks at 262 ft! An exceptional example of the artisans' savoir-faire in the Middle Ages, the Mont-Saint-Michel is not the only remarkable monument in Normandy. This region has indeed witnessed the development of great architectural styles. It was even the precursor of the Gothic style, with the Norman School, whose masterpieces were Saint-Nicolas' Church at Caen, Bayeux Cathedral and Lessay Abbey. Indeed, with all this, you can understand why this region had to be liberated first! The most visited site in France, Mont Saint-Michel welcomes more than 3 million visitors every year. It's useless to say that when visitors arrive in front of the famous abbey, they are seldom alone! They come in entire busloads to visit this Mecca of religious architecture known around the world. In spite of the many car parks, it isn't always easy to find a spot and you often find yourself caught up in the constant hordes of visitors. If you are looking for the best time to visit, with optimal conditions, avoid going on weekends, during the school holidays and in the middle of the day. In fact, this rule can be applied to all of the tourist sites on the Normandy coast, whether it be Deauville, Etretat or the D-Day landing beaches. Weekends, bank holidays and school holidays are synonymous with crowds for these tourist areas where Parisians in particular like to meet up. Less busy, the countryside is too often ignored by the avid visitors of small seaside resorts. However, the Norman hedged farmland hides many little gems which it would be a shame not to discover during a stay in the region. There are the cities of Rouen and Caen with their history-filled streets, Giverny, famous thanks to Monet, the Perche National Park and Normandy's architectural heritage (Jumièges Abbey, Ladies Abbey and Men's Abbey of Caen, Château d'O, Château de Vascoeuil) which are all really worth visiting. In between, you can meet cider, calvados and camembert producers to purchase and bring some home with you. Although it does rain less than is rumoured in Normandy, we do recommend you take an umbrella or a raincoat with you, as well as a jumper since it is often windy. Whether you choose warm oysters with Pommeau (an apple distillation), brown shrimp from the bay of Mont Saint-Michel (with a slice of buttered rye bread and a few drops of lemon), or blue mussels, followed by the famous 'trou normand' (a glass of calvados taken as a digestif between courses), seafood is the star attraction of Normandy's cuisine. main dishes such as salt-marsh lamb from Mont Saint-Michel bay with green or dwarf kidney beans, Caen-style tripes, or Trouville-style sole, followed by a variety of cheeses like Camembert, Pont-l'Evêque, or Livarot. When it comes to dessert, sugar, butter, and apples are the watchwords. 'Teurgoule', which is baked rice pudding served with 'falue' (a type of bun), is a speciality from Honfleur. There is also 'Tarte Normande', which is made using apples cooked in cider and comes in many variations. In the region around Evreux, several sweets feature among the favourite dishes picked out by Normandy's Regional Tourism Federation: 'Caprices des Ursulines' (small almond-based biscuits produced by the Auzou confectioner in Evreux), 'Pavés d'Evreux' (pralines with a soft centre from the Duval confectioner in Evreux), and jams and preserves from La Passée d'Août farm in Miserey. In 1888, Annette Poulard opened her hotel on Mont Saint-Michel. Its opening coincided with the time when 'La Merveille' (The Wonder) was opening up to modern tourism and, very quickly, the quality of her cooking, combined with the arrival of large numbers of French and foreign tourists, meant her good name was assured. As her reputation spread, Annette came to be known as 'Mère Cuisinière' (mother and cook) in a period that marked the real coming of age of La Mère Poulard. Its success comes from the locally-inspired cuisine, based on produce from the surrounding land and sea. Combining tradition and imagination, the menu includes recipes that are both delicious and unforgettable, for example: salt-marsh lamb dishes, free range poultry, local fish and shellfish, vegetables from the low-lying land, different types of crèmes, and Calvados (apple brandy distilled in Normandy), not to mention, of course, the famous omelette. Nowadays, despite the existence of many willing successors, La Mère Poulard remains an institution and part of the heritage of Mont Saint-Michel. This gourmet restaurant is located in the historic La Mère Poulard hotel. It is decorated with an extraordinary collection of 3,000 period paintings, engravings, and photographs, making it a real journey into the history of Mont Saint-Michel. Enjoying a meal here is a feast for the eyes and taste buds thanks to the head chef, Michel Bruneau (founder of the 2 star Michelin restaurant 'Bourride'), who devotes his life to the great outdoors and to French culinary creation. If you wish to combine an excellent meal with a magnificent view over a grandiose and constantly changing setting, the panoramic restaurant is the place to be, with its vantage point overlooking the most beautiful bay and some of the highest tides in the world. If you are as interested in preparing meals as you are in eating them, at La Mère Poulard's cooking school you can learn how to prepare dishes from Normandy and Brittany under the tutelage of chef Michel Bruneau. Having done this, you can then go home and make the recipes you tasted at the restaurant yourself. Call +33 (0) 2 33 89 68 68 for information and bookings. Grand'Rue, 50116 Le Mont Saint Michel. 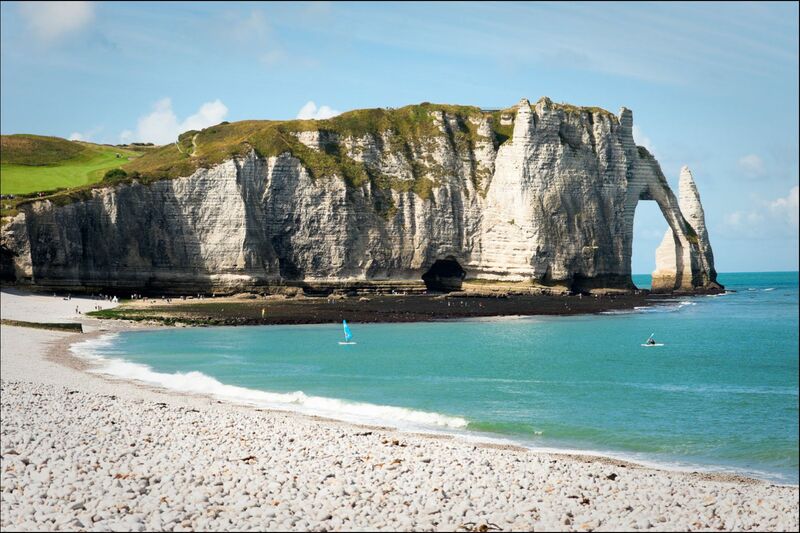 Find weekly weather forecasts for Normandy . Different criteria make it possible to predict with precision the best time of year to go to Normandy . 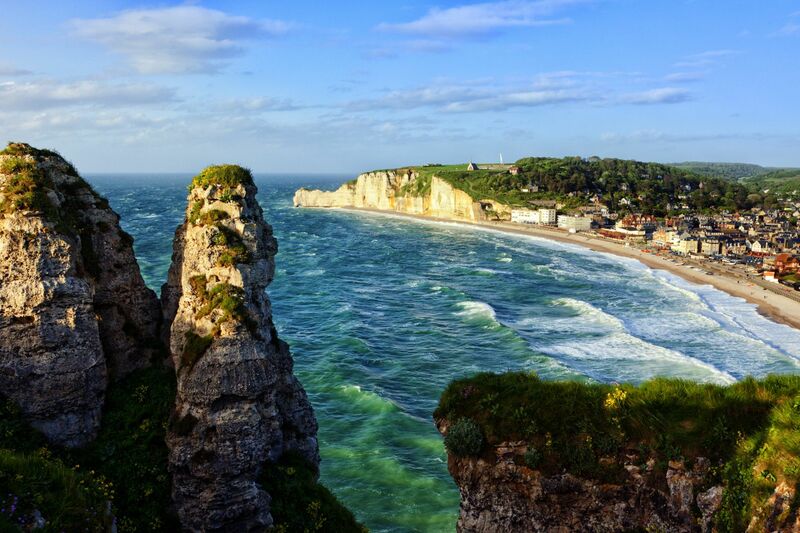 A comprehensive weather score, made up of temperature indicators, bad weather predictions, sunshine levels and wind speeds, will allow you to choose the activities best suited to the weather conditions and therefore make the most of your holiday in Normandy . Our journalists' reviews for you 21 hotels France . Take a look at our hotels, their facilities or their value-for-money score according to your departure dates so that we can find the best offer to suit you France . Book a hotel France it's never been so simple !